The first part of the program covers Southern Railway #154, an 1890 product of the Schenectady Locomotive Works that returned to operation in July, 2010, on The Three Rivers Rambler in Knoxville, Tennessee. Sometimes it is better to be lucky than good, and we got lucky as we were scouting the line as #154 made an unpublicized shakedown run the day before the first passenger trains ran. In addition to the passenger consist, a string of vintage freight cars was tied to the tender. The following day we shot three runs of The Rambler as it traversed the line between downtown Knoxville, including the two percent grade east of town. The second part of the program covers Southern Railway #401, a 1907 Baldwin operating at the Monticello Railway Museum in Monticello, Illinois. We shot the locomotive operating on a cold, wet and windy April weekend; and again the following month when the weather was considerably warmer and the trees considerably greener. We shot from many locations along the museum�s trackage, as well as from the cab. We also mounted a camera on the locomotive to get an up close and personal look at the running gear on a photo run for the Blackhawk Chapter of the N.R.H.S. The third part of the program features Southern Railway #630, a 1904 product of Alco�s Richmond works. From the cab, trackside, and with a locomotive mounted camera, we come along as the former Southern steam excursion star runs from East Chattanooga to Grand Junction and return over the tracks of the Tennessee Valley Railroad Museum. #630 was the last of the three to return to operation, entering service in March, 2011. All three of these locomotives have been beautifully restored and have never looked better. They sound great too, and this video features some of the prettiest whistling you�ll ever hear. The main program runs 75 minutes, with an additional 20 minutes of bonus footage and previews of other titles totaling nearly 115 minutes on the disc. 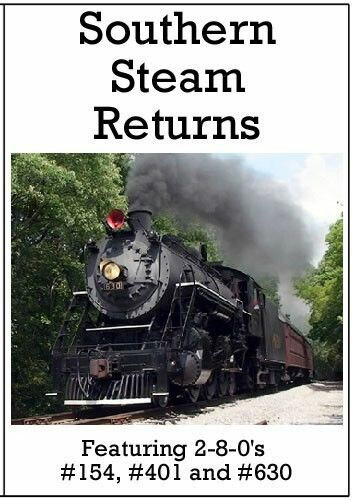 Any fan of steam locomotives or the Southern Railway will want a copy of this new DVD from Diverging Clear Productions!